Stock photo of Columns at the entrance to the Nationaltheater Mnchen (National Theatre Munich), City of Mnchen (Munich), Bavaria, Germany, Europe. Columns at entrance to the Nationaltheater Mnchen (National Theatre Munich) in City of Munich. 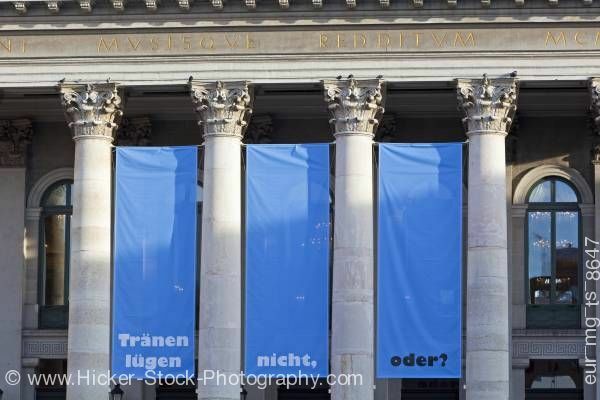 This stock photo shows the classic round columns at the entrance to the National theater Mnchen (National Theatre Munich), City of Mnchen (Munich), Bavaria, Germany, Europe. The beautiful classic architecture has round stone columns with decorative capitals support the entablature to the entrance of the National Theatre Munich. The capitals have two rows of curved leaves which is a unique decoration of Greek Corinthian architecture. Between each column hangs a light blue banner. The first two banners have white letters at the bottom, while the third banner has black letters. Mirrored windows with an arch frame sit in the background of the columns. Gold letters sit above the attractive columns. Columns at the entrance to the Nationaltheater Mnchen (National Theatre Munich), City of Mnchen (Munich), Bavaria, Germany, Europe.